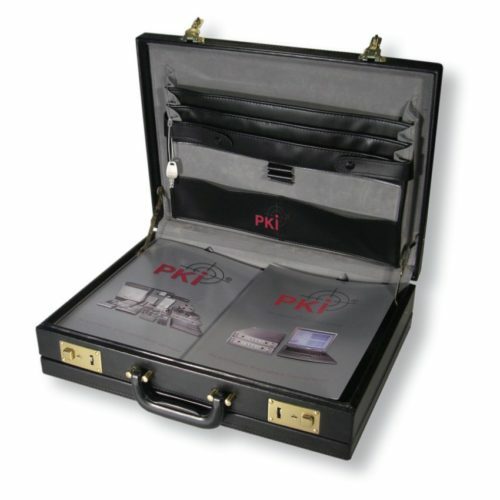 The PKI 9710 has been developed for secure transportation of various valuable items, such as cash money, jewels, important documents, etc. It features multiple functions to avoid theft and pilferage. Sensors are integrated in the handle and both surfaces of the suitcase, which can be activated, so that the PKI 9710 emits high-voltage pulsed electric shocks of 30 KV. The wireless activation is done by means of a small remote control that must be carried separately from the suitcase. This remote control also activates the “loss function”, which prevents from simply forgetting it somewhere during voyages or theft. If the distance between the remote control and the PKI 9710 exceeds 3-15 m, a loud warning signal will be emitted. If ever the suitcase has really been stolen by someone, for your own protection you should wait until the person has obtained a distance of at least 50 m, in order to activate the anti-robbery function of the suitcase, which will activate the alarm signal as well as the high-voltage electric shocks.